January is a big let-down for Christmas addicts, like me. 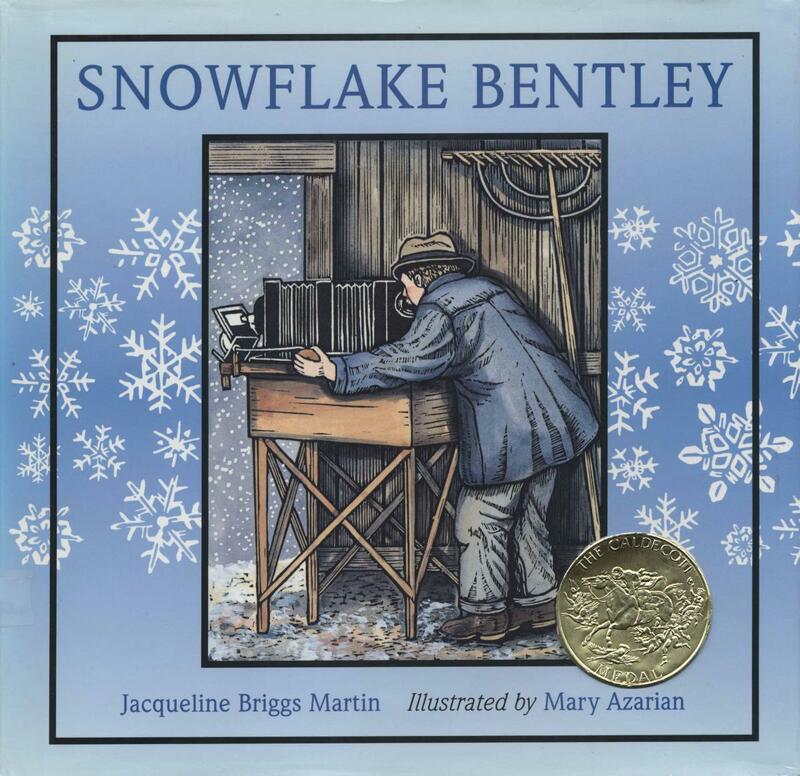 In an early 2012 podcast, Jeremy advocated that we ease out of Christmas with a month of snowmen and snowflakes, still appropriate for winter, but neutral on the Christmas scale. 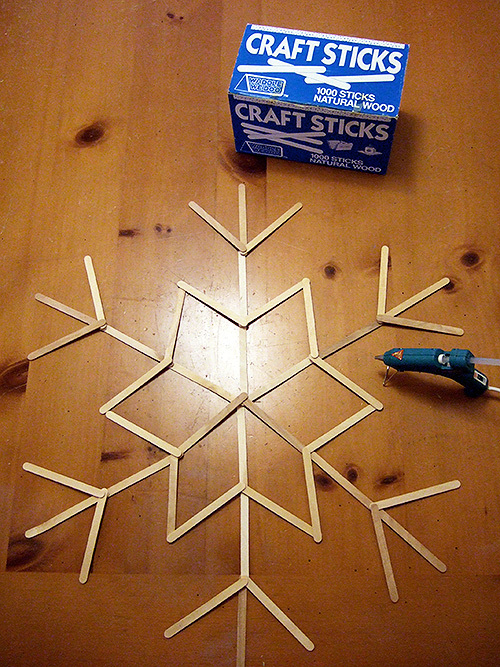 In this spirit, I decided to explore some snowflake crafts. 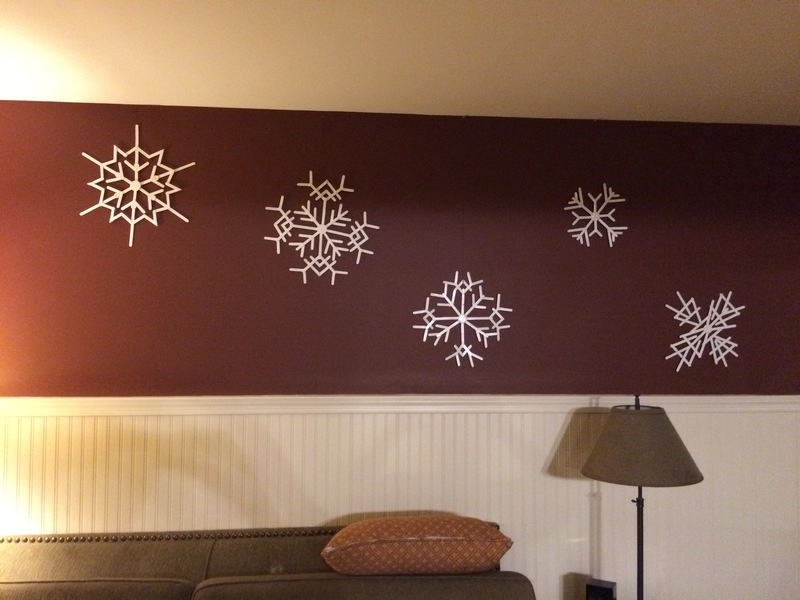 Last winter, my mother-in-law gave me a beautiful white curly paper snowflake. I studied it and couldn’t imagine how it was made. She said, “Oh, they’re easy, I’ll show you sometime.” When the holiday season ended, I put it in the attic and forgot about it. “Sometimes” don’t always happen, and a year later, when I arrived for a visit with paper, scissors, and tape and entreated her to demonstrate, she shook her head, “I don’t know how to make those!” She smiled the knowing smile of someone who is sure I’m a little crazy. 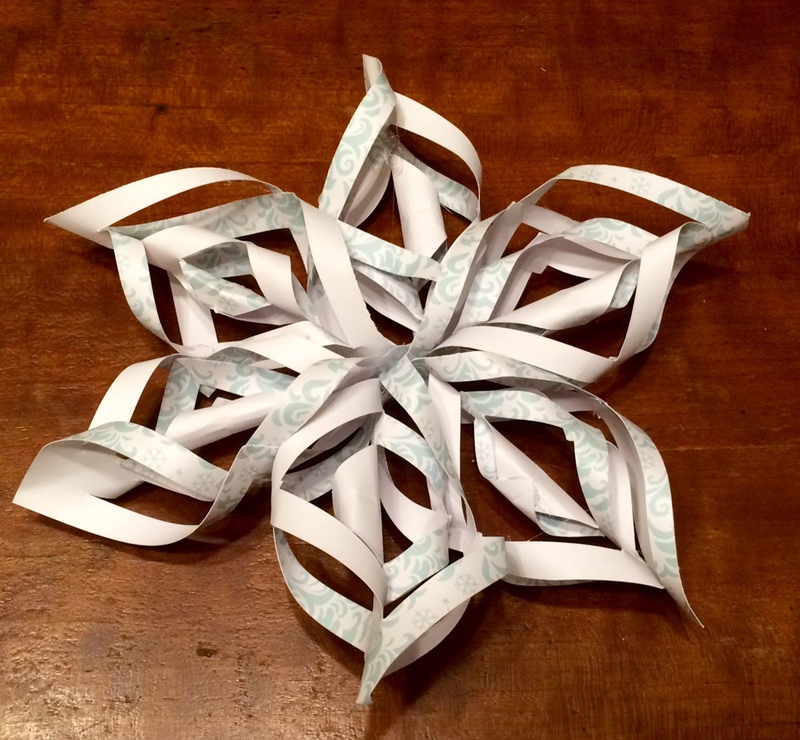 I resorted to YouTube and found plenty of tutorials for the twisted paper snowflake. They are so much easier than I imagined! This tutorial is my favorite because the finished product isn’t the typical giant, 16-inch white snowflake. I found that they can be made just as easily with 2- and 3-inch squares. Today, I met with my friend, Donna, for coffee and crafting, and we set to work on 6-inch snowflakes made from craft paper. We were delighted with our nearly instant results. She said she would try to make them in bright spring colors and create a paper bouquet for a friend. At my doctor’s office they decorated the entire ceiling in red curly snowflakes, hanging evenly spaced every ceiling tile–beautiful. 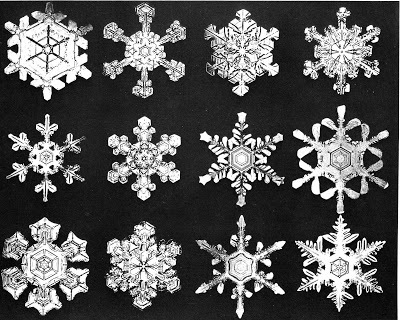 Children could easily handle the larger snowflake. The smaller version takes more small motor skills. Have fun making a blizzard of these! 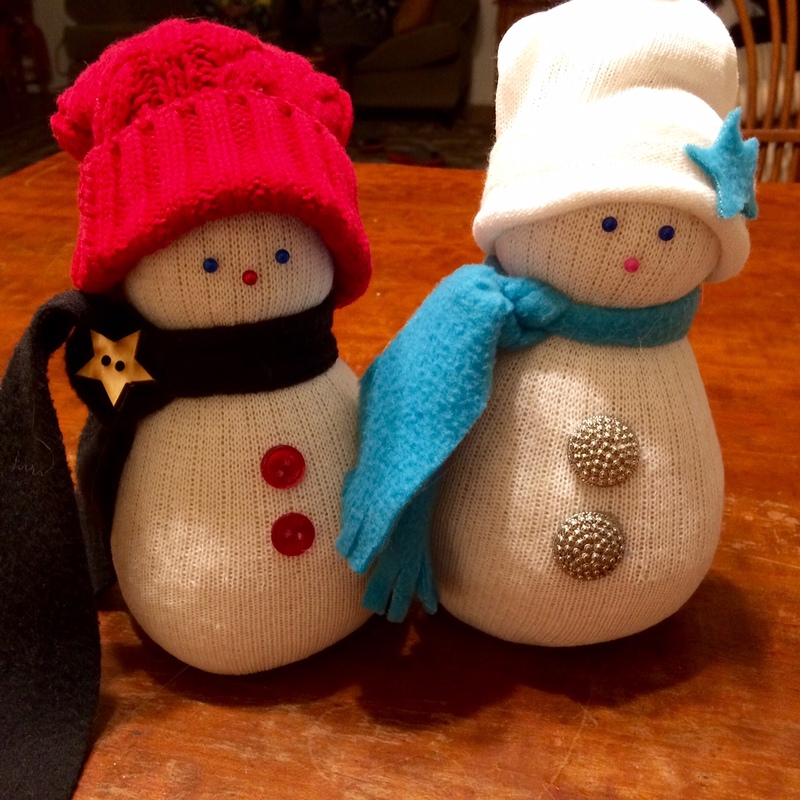 Two friends sent me this two-minute video by Handimania demonstrating how to make a sock snowman. Although there are plenty of websites detailing similar instructions, I was amazed by the ease with which my kindergarten grandson was able to follow her video. We loved making these little guys. The socks I had weren’t snowman-worthy, so I had to make a trip to the dollar store. Still, my total cost of one snowman was less than $1.00. The only tip I can add to the video demonstration is that you will need twice as much rice as you think you need. We kept adding and adding. I wish I had purchased better-quality socks because thicker cotton would have had a nicer finish; however, if this is a large-group craft, you can’t beat two snowmen for $1.00. Costco had great socks, 8 pr. for $10.00. If I were throwing a party, I’d choose them. Every year, during the holiday season I struggle to think of a success-guaranteed project that could also create laughter and competition. At a party for children, teens or adults, each member could make and personalize a snowman to build a village of friends. Watch the video to the end, and you will see a parade of snowmen that will give you ideas. 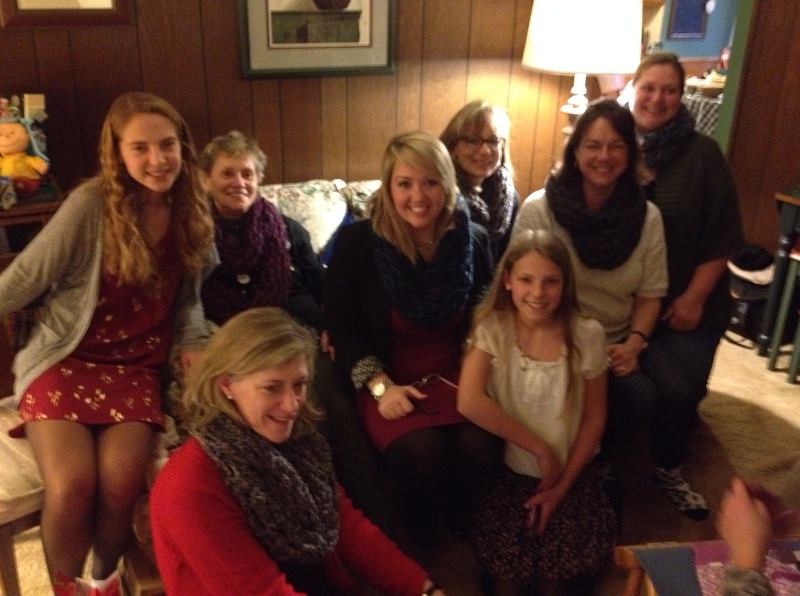 Grandma and aunts wear arm-knit scarves knitted by Nicole (left) and Katie (right) on Christmas Eve 2014. Arm knitting was a craze that swept the Pinterest crowd last winter. If you check out the examples, you will want to give it a try. The scarves are perfect to give as gifts next year—use these winter months to stock up for Christmas 2015. In November 2014, I was trying to come up with a craft that would suit the discriminating teenage taste of my two nieces. Our tradition, ever since they were 5 and 7, has been to make a craft together that they can give to their aunts, teachers, and adult friends. I forget what most of these items are, but I went to my sister’s house after Christmas, and I saw evidence everywhere of the years of crafting—the holiday table runner, the dessert dish candle ornament, the teacup pin cushion, the hot chocolate Christmas ornament. It was deeply satisfying to see the fruits of our joint labors over the years, but as they are now much older and independent, I can’t dictate the craft like I used to. Enter arm knitting. I saw a Michael’s video of arm knitting and casually suggested it to the girls. The YouTube video sparked their interest, and they agreed to try. Purchasing the yarn without them was a little more difficult. I went for oatmeal, gray, black, brown, and a blend of purple/black and gray/black—boring colors, for sure. Would they like these? I should have taken them on a shopping spree to choose for themselves, but I was swept up in the a Michael’s Black Friday 25% off sale, and couldn’t keep my wits about me. Ultimately, I did the math, and I paid about $7.00 per scarf. It’s our tradition to make 12 gifts (this covers all of the aunts and grandmothers on both sides and a few adult friends/teachers). That’s under $100.00, which is very reasonable. Shirley, looking calm, after we master the arm-knitting tutorial. To make sure I didn’t look really foolish in front of the girls, I demanded that Mom (Shirley) and I try it first. This afternoon of studying the YouTube video on the iPad and starting (and re-starting) our respective scarves resulted in two precious hours of giggling mother/daughter time. Each of us produced a scarf of ridiculous bulk and length. We decided to send one to Aunt Rosalie and one to a mutual teacher friend. I admit to chickening-out on the second gift because the scarf was so marginal in quality, I couldn’t even donate it. If you have trouble with the speed of the Michael’s video, there are a wealth of step-by-step tutorials online. Flax and Twine offers a nice photo tutorial. The hardest part is casting on (much easier with practice). Don’t give up. I cornered my nieces at a family gathering the first week of December. It wasn’t ideal timing—we holed up in a spare bedroom when we should have been politely socializing—but I was worried about their candid response. What if I just bought a suitcase full of yarn, and they didn’t like making the scarves? Instead, they took to it much more quickly than my bumbling first attempts. In a matter of 30 minutes, Katie had created a beautiful scarf (the appropriate length), and Nicole was right behind her. Instead of working side by side, I released my arm knitters to their own devices. This is the perfect example of the proverb: “Give a man a fish and you feed him for a day; teach a man to fish and you feed him for a lifetime.” Our girls said, “Thanks for the yarn,” and I didn’t hear from them again. Christmas Eve, they presented their aunts with the scarves, and we were thrilled. Katie, whipping up her first arm-knit scarf. I made some scarvesfor friends, too. I decided that I would re-invent the arm scarf into the “Friendship Scarf.” I gave a knitted scarf and put it in a gift bag with two skeins of yarn with the promise that I would teach the recipient to arm knit. She can “pass it on” to her friends! Angels are spiritual beings, messengers of God, represented in human form with wings and long robes: at the holidays, they grace Christmas cards, nativity scenes, wreaths, and more. Many families top their Christmas trees with stars or angels, and, since we have been married, Roger and I have been searching for just the right one. For a while, we’ve skipped topping the tree with anything. A second definition of “angel” is an exemplary person, one whose conduct is virtuous. This is a story of one knitted angel made more beautiful by the many angels who have loved her. As Jeremy and I were planning our Knit-mas Tree, I recognized that the difference between ordinary and extraordinary was going to be the tree-topper. 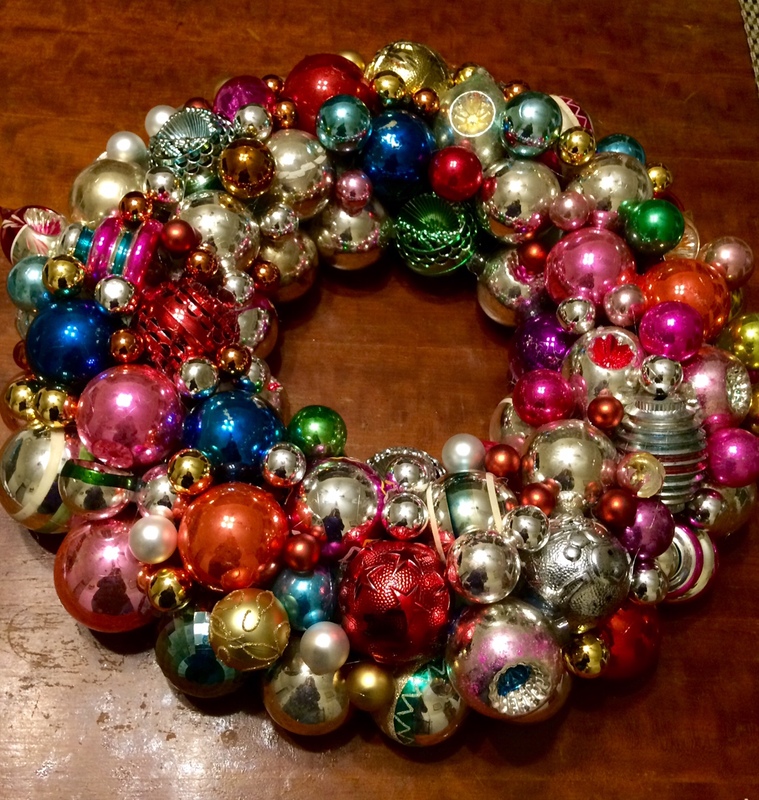 When my creative and talented–knitting–godmother, Rosalie Hughes, visited Maryland for her high school reunion in October, I seized the opportunity to present her with pictures of all of the knitted ornaments I planned to make and to solicit her advice on our Knit-mas tree. Buoyed by my enthusiasm about the tree and the Kennedy Krieger event, she impetuously volunteered to knit the angel as a gift for my November birthday. I was thrilled and gave little thought to the commitment she had just made. 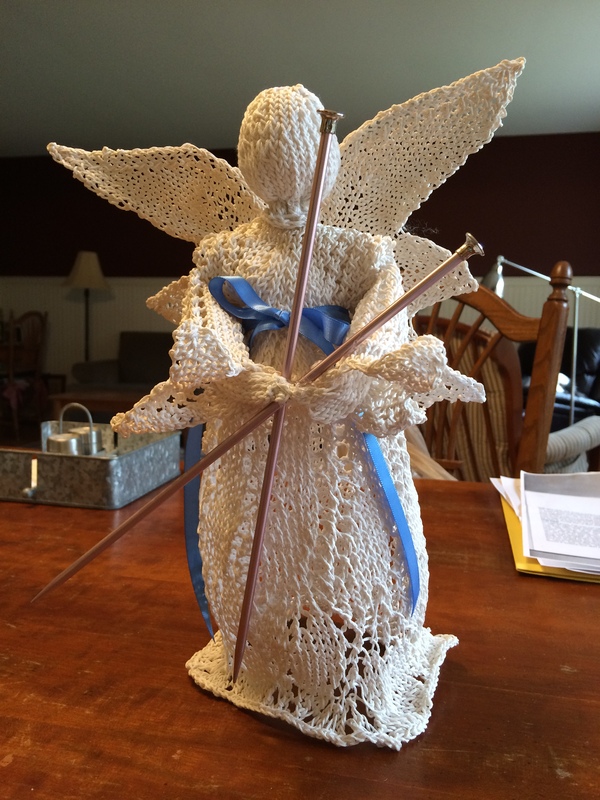 What’s difficult about knitting an angel—my aunt can knit or crochet anything! Rosalie returned to Iowa and began to visit every yarn shop in the area (which, if you’ve ever traveled in Iowa, is a considerable distance). She Googled “Tree Toppers” and then settled on ordering a book on Amazon, Angels: A Knitter’s Dozen. 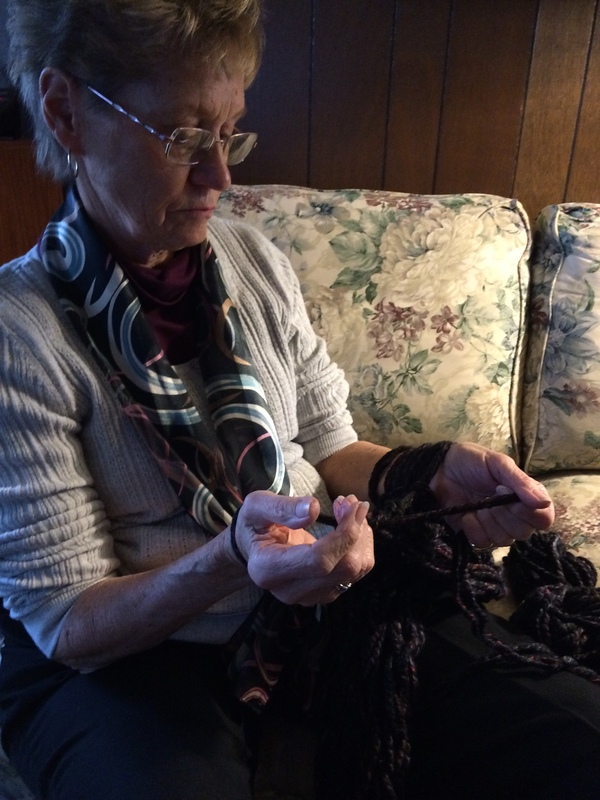 Friends in Rosalie’s prayer shawl knitting group knew about her struggles as she consulted their expertise—they agreed with her that this “labor of love,” this heavenly being, was not all light and air. Then, one mid-November day, I got an urgent call from Shirley. The angel had arrived—in pieces—with pages of Xeroxed directions for her ultimate assembly. And this would require a brew of cornstarch. Mom said she wasn’t sure she was up for the task. This is where my good friend, Gini (Angel #3, if you are counting) comes into the story. We had invited her for dinner and a movie, but I told her I needed her help with a special holiday project. She agreed, with the same foolish optimism I had exhibited. How hard can this be? When I unfolded the directions and the delicate white body parts, she reached for her reading glasses and rolled up her proverbial sleeves. Oh, did I mention, we were just 48 hours from the tree decorating event? We starched our girl and placed her on forms, with Roger (Angel #4) offering vases, pots, bowls and other random shapes on which to let her dry. The dinner and movie were put on hold. The next day, she was damp and rumpled. I was not hopeful. That’s when I decided she needed a careful blow dry. I put on headphones to listen to a long chapter of a Victorian novel and secluded myself in the bathroom. Hours later, shaping the stiff pieces with needle and thread, she was looking much more heavenly. It wasn’t until I sewed her hands together in prayer holding a pair of knitting needles that she was transformed into the perfect tree topper. 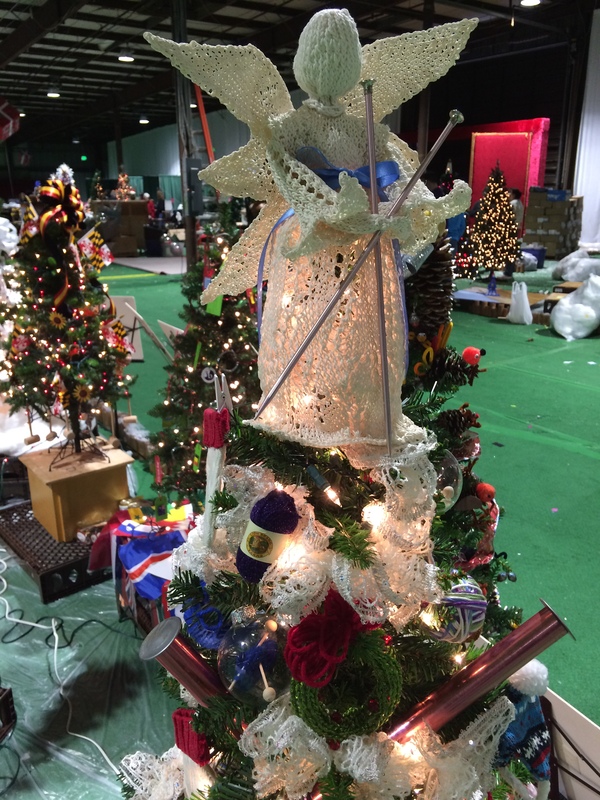 Indeed, everyone who stopped by the tree during the three days it was on display, remarked how the angel was amazing. The tree was sold the first day, but the angel story doesn’t end there. Angels #5, 6, 7, and 8 (my sister Barbara, her husband, and two daughters) decided that the Knit-mas tree could not go home with just anybody. A stranger could not properly appreciate my aunt’s efforts. The angel needed to stay in the family. Secretly, they bought the tree and had it shipped to my mother’s—to surprise me on Christmas Eve. My mother’s house is outside of the 40-mile delivery radius. So that required Angel #9 and his family. My Catonsville brother took delivery of the tree and sent it on to Mom’s house, where it spent Christmas with all of us. The Knit-mas tree has had a second life in Vermont, at my sister’s vacation home. The angel (and tree skirt) came home with me. She perched on our tree (with her head bent a little in prayer because she was mashed against the ceiling) until yesterday, when we filled her nooks and crannies very carefully with tissue paper and packed her away until next year.